Estos días, he tenido la necesidad de encender algún pc en remoto, mediante wake on Lan y aprovechando que tenía una raspberry Pi, decidí meterle mano. 0 actualizados, 1 se instalarán, 0 para eliminar y 8 no actualizados. Necesito descargar 11,5 kB de archivos. Se utilizarán 57,3 kB de espacio de disco adicional después de esta operación. Seleccionando el paquete wakeonlan previamente no seleccionado. Y ahora a ver la estructura…. Otra entrada que es un apunte. Recientemente, ha caído en mis manos un cisco 7912 para jugar y, venía con firmware SCCP. En mi asterisk, sólo uso SIP, ya que todo el sistema lo tengo con ese protocolo… hasta las llamadas y el DDI. Empezamos por pasar el teléfono de SCCP a SIP. # Cisco 7912G IP Phone with minimal effort. # again to create a new profile and place it in the TFTP directory. # if corresponding gk is not found on the TFTP server. # (disabled) if configuring via the phone's web interface is desired. Guardamos cambios, reiniciamos el teléfono y esperamos a que se instale el firmware sip. 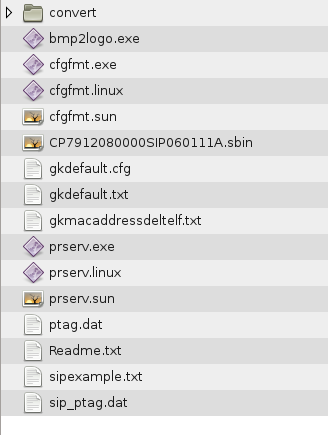 # formating tool (cfgfmt.exe) to treat it as a text file. # formatting tool ignores any line beginning with the token. # if no prior value had been programmed. # Description: Control access to the web page and some protected phone menus. # require the value of UIPassword being entered. # information and network configuration and statistics. # Parameter changes are not allowed via the web interface. # resets this value to '1'. # NOTE: The default values listed below will not trigger any upgrade. # Options: 1 = Use DHCP to obtain IP, route, netmask, DNS, NTP, TFTP, etc. # IP, route, netmask, DNS, NTP, TFTP, etc. # Description: User ID used for authentication, if different from UID. # Description: Port to listen for incoming SIP requests. # The same port is used for sending outgoing SIP requests. # Note: If set to greater than 10, default is 10 times. # Description: Outbound proxy server that processes all outbound SIP requests. # destination specified in the Request-URI of the SIP message. # An outbound proxy may or may not be the same SIP proxy server. # INVITE request are retransmitted to the current SIP user agent. # 1-3 RESERVED. Must be set to 0. # 6-31 RESERVED. Must be set to 0. # Defaults are marked with *. # Description: Transmit frames per packet. # Note: G.711 and G.729 frame sizes are 10 ms per frame. # Cisco recommends that you use only the default value 2. # *0 = Disable. INVITE is sent via local proxy. # 1 = Enable. INVITE is sent via specified URL. # 5-15 RESERVED. Must be set to 0. # "Contact: ;expires=0" is used. # 17 RESERVED. Must be set to 0. # 23 RESERVED. Must be set to 0. # 25-31 RESERVED. Must be set to 0. # to decide what action to take. # Use the following table to select the correct TimeZone value. # that fall on 30 and 45 minutes zones. # information will be incorrect. # Description: IP address or URL of TFTP server to use. # Description: Interval (in seconds) between each configuration update. # Note: If set to less than 60, default is 60 seconds. # Default is marked with *. # file when this parameter value is non-zero. # its profile as without the "x" extension. # Options: *0 = EncryptKey parameter value is used. # decrypt it using the EncryptKey parameter value. # decrypt the profile with this key. # upgrade package, is need to capture the debug information. # specify "192.168.2.170.9001" as the value of this parameter. # 1-7 RESERVED. Must be set to 0. # 9-31 RESERVED. Must be set to 0. # Options: 0 = Disable IP dialing detection. # IP address is being entered. # Description: Dial plan rules. # Note: No syntax check is performed by the actual implementation. # the dial_plan is syntatically valid. # of preventing non-matching dial string from being sent out. # (time out can be changed as digits are entered). # completely first will cause trigger the send). # a-z -- which ranges 0 to 26). # o more than one rules are separated by |. # more rules in less space. # rules after that matching rule will not be used for matching). # if 911 entered, it will be sent out immediately. # 140887133445, the timeout chaned to 5 seconds). # if 0 is entered, after 4 seconds, it will be send out. # if 011 is entered, the time out changed to 9 seconds. # Description: Control phone ring characteristic. # Note: Values specified below are recommended for the U.S.
# For Reorder Tone, value range is 1 to 3. # Number of cadence pairs (0 - 2). # For Reorder Tone, value range is 0 to 3. # To specify a steady tone, set value to 0. # repeated before proceeding to the (OnTime[x], OffTime[x]). # tones, the unit is the number of samples. # be set to 0. # 2. Values specified below are recommended for the U.S.
# precedence and delay of Audio and Signaling IP packets. # 8-13 RESERVED. Must be set to 0. # 26-27 RESERVED. Must be set to 0. # begins to move automatically. # 2 RESERVED. Must be set to 0. # 10-14 RESERVED. Must be set to 0. # 16-31 RESERVED. Must be set to 0. # 6-17 RESERVED. Must be set to 0. # 30-31 RESERVED. Must be set to 0. # If port number is not specified, 5060 is assumed. # and destination server of Keep Alive packets. # 12-17 RESERVED. Must be set to 0. # 19 RESERVED. Must be set to 0. # 23-31 RESERVED. Must be set to 0. # only available option is to enable SIP KA to Proxy Server. # Note: Set value to zero (0) to disable this feature. # Description: Name to be displayed on phone's LCD screen. # the value in "DisplayName", if any, on the LCD screen. # on the top line of the LCD display. # All other characters are shown as is. # Description: Enable or disable "Do Not Disturb"
# Note: If attended call transfer is disabled, the "Trnsfer"
# softkey will not be shown on the LCD screen. # will not be shown on the LCD screen. # Note: If enabled, anonymous incoming calls will be rejected. # value (see SigTimer bits 14-19). # call preference option is displayed on the LCD screen. # displayed on the LCD screen. Guardamos el fichero en el tftp y ahora toca compilar el fichero para que el teléfono lo pueda leer. Para instalar asterisk 1.8 en debian 6.0, con soporte ODBC para el cdr en MySQL, seguiremos los siguientes pasos. Partimos de una debian 6.0 recién instalada. 5) Run "contrib/scripts/get_mp3_source.sh" <-- IMPORTANT or you won't have MP3 source to compile and your build will fail! 6) Run "make install"
Hacemos el tar -zxvf de todos los ficheros y copiamos en /var/lib/asterisk/sounds y listo.